Suzanne works in the BFIT classroom in Humboldt. She has also worked in the Life Skills program and as a Language Resource teacher for ESU 4. Previously, Suzanne taught in Glendale, CA; Lincoln, NE; and Auburn, NE. 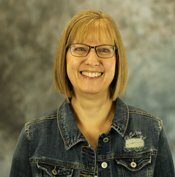 Suzanne graduated from Concordia University with an elementary education degree and a concentration in early childhood. Since that time, Suzanne has completed 30 hours beyond her bachelors degree and currently holds a standard teaching certificate.